Based on the work of renowned manga artist Yoshihiro Togashi, Hunter x Hunter was initially developed into a television series in 1999 to 2001. A reboot of the series was later announced in July 2011, with the new Hunter x Hunter airing in October of the same year in Japan. A new generation of anime fans were introduced to the series when an English dub of the popular anime was aired on the Adult Swim channel’s Toonami block in April 2016. The show’s deconstruction of popular shonen tropes, engaging characters, and well-balanced, gritty plotlines continues to captivate audiences around the world. The first season of Hunter x Hunter revolves around the Hunter Exam Arc. It’s technically composed of 26 episodes, but most Hunter fans consider episodes 21 to 25 as the Zoldyck Family Arc. The season also has two recap episodes – 13 and 26. The Hunter Exam arc begins by introducing three of the four protagonists – Gon Freecss, Kurapika and Leorio. The three meet on a ship that’s sailing to the exam venue for those who want to become Hunters, elites with strange powers. Another main character, Killua Zoldyck, is introduced four episodes in. The four characters have different reasons for becoming hunters. For instance, Gon wants to meet his father, the famous Hunter, Ging Freecss while Killua wants to get away from his family legacy. The rest of the season’s episodes showcase the various tests they have to face on their way to getting their Hunter licenses. Viewers are also introduced to characters like Hisoka and Illumi and a little bit of world building. In this story arc, every Hunter hopeful turns out to have certain intriguing skills and powers, the development of which will be touched on in other story arcs. One of the things that sets Hunter x Hunter (2011) apart from other animes is its surprisingly engaging characters. Those familiar with the shonen genre will easily see similarities between this four group of friends and those from animes like Yu Hakusho or Gensumaden Saiyuku. However, the Hunter Exam arc quickly establishes that these are not your typical shonen characters. At first glance, Gon is the typical loud, innocent, dim but powerful hero, much like Dragon Ball’s Goku. But the first episode of the Hunter Exam arc quickly disabuses viewers of that. Gon is undoubtedly strong, but you can also see he’s clever as he attempts to capture the Lord of Fishes. He also showed an aptitude to learn quickly and can be canny if he wants to be. Meanwhile, Killua is Gon’s exact opposite. The white-haired lad is shown to be cold, calculating and scary powerful. Much like Hakusho’s Vincent, he’s undoubtedly deadly, a fact that’s reinforced when it’s later revealed that he came from a family of assassins. But Killua is not just a killing machine. He’s also a young boy with a heart, one who just wants to play and become friends with Gon. As for Kurapika and Leorio, while they’re vital to the group, their presence this season isn’t as defined as Gon and Killua’s. However, Kurapika’s mysterious vendetta makes him more intriguing, while Leorio is relegated to the role of token strong human. 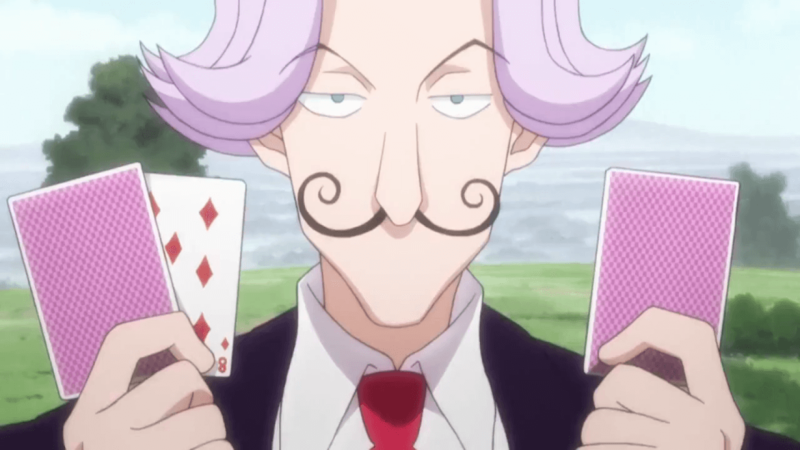 Then there’s Hisoka, a jester who straddles the fine line between villain and ally. Viewers will definitely take notice of him, if only for his disturbing moral ambiguity and twisted fascination with Gon. Hisoka is also how viewers are introduced to Illumi, another creepy assassin and a Zoldyck. Since it’s the first season, the writers can’t exactly delve into each character’s backstory. But the Hunter Exam arc will give you enough tantalizing glimpses to make you want to know more. Luckily for Killua and Kurapika fans, their interest will be satisfied as the two will get their own story arcs later on. 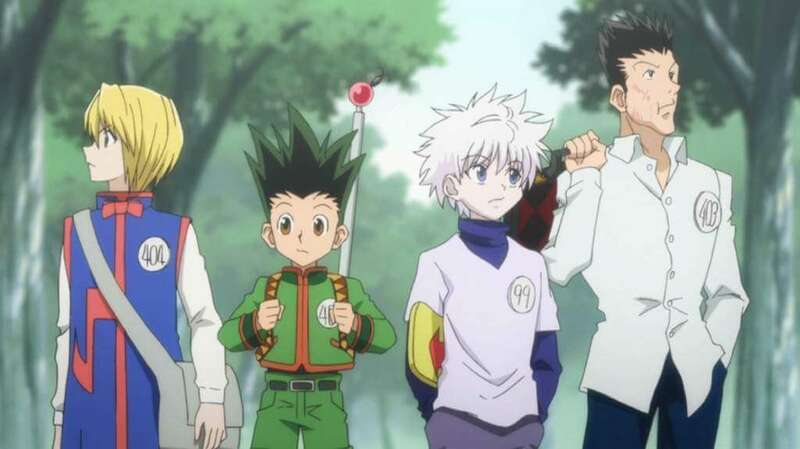 Hunter x Hunter initially appears as a typical shonen, a group of friends off on adventures. You have the usual leader, misfit, and wise friend. The Hunter Exam arc starts off like that, with lighthearted and funny episodes. But it does get progressively darker at times, and the heroes have to make some morally ambiguous choices. Unlike other shonens, Hunter x Hunter shows that brute strength doesn’t always win the day. Yes, Gon is powerful, but he’s also cunning and strategizes to find ways to trip his opponents. This is seen in how he captures the fish in the first episode and how he stalks Hisoka. The use of logic is also emphasized in the episodes Test of Tests and Last Test of Resolve. Some anime fans might lament the lack of brawling in most episodes though. But what fights are shown are epic and thoughtfully orchestrated and visualized. However, some of Gon’s fights are disappointing as his victories can’t really be called conclusive. Meanwhile, Killua’s fights are pretty brutal, which might sometimes lead to a disconnect among fans who prefer his happy side. The remake is done by Madhouse Studios, so the animation in the Hunter Exam arc is smooth and professional looking. The colors are crisp and the drawings are sharp. Anime fans won’t be subjected to any of the haphazard CGI that seriously hindered the new Dragon Ball series. The series’ soundtrack is good, but not outstanding. The opening theme song is catchy, with all episodes using Ono Masatoshi’s single, Departure. This is a good move as the song has become synonymous to Hunter x Hunter. However, the production company went the opposite direction for the closing song, as the entire series had about five closing songs. It’s impressive that despite its age (or maybe because of that), Hunter x Hunter remains one of the most engaging and popular animes out there today. The airing of an English dubbed version undoubtedly just added more fans to the Hunter community. The Hunter Exam arc is admittedly very basic, as it just introduced the characters and the idea of Hunters. But it did lay a strong foundation for the characters and the direction and style of the anime. The season broke some of the usual shonen tropes and its nod to brains over brawn is refreshing. The characters are also quite humanized, although there’s the usual twisted outlook.